The new route allows you to go from Victoria Park Rd to the Uof T Scarborough Campus without transferring. The 12D Kingston Rd. continuous bus service pilot project was announced officially to the public on Saturday July 28th. The new service will run along Kingston Road from Victoria Park Station to the University of Toronto Scarborough Campus. “My residents will be thrilled to be able to get from point A to B without transferring three times. I’m confident the pilot will be successful and look forward to making life a little easier for our communities.” said Councillor Ainslie. “I’m elated that our communities will be getting the long awaited continuous bus service on Kingston Road. This will make life easier for transit users, cut wait times and ease congestion.” Councillor Crawford commented. 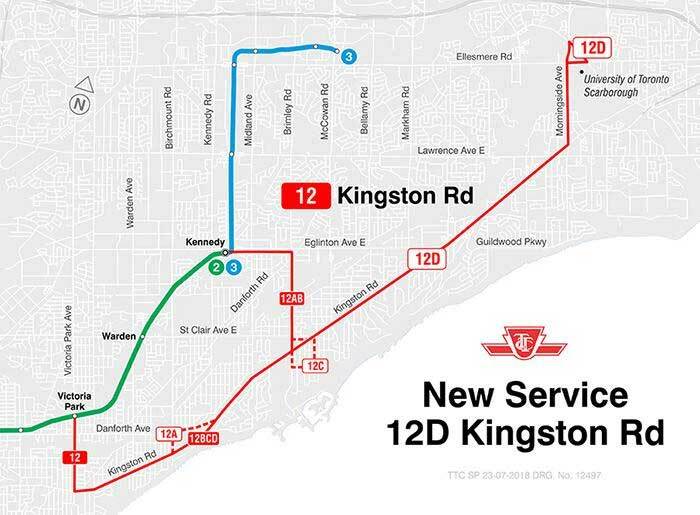 The 12D Kingston Road will run weekdays between 6:00 am and 9:00 am, with service scheduled every 30 minutes, and between 3:00 pm and 7:00 pm, every 25 minutes. TTC Chair Josh Colle expects approximately 1,800 customers will use this new service daily. As part of standard operating proceedure the TTC will conduct a review of these new services after one year. Scarborough includes the 902 Markham Rd. Express. The new express bus service along Markham Road is starting in September 4, 2018. It will operate from Warden Station to Sheppard Avenue via Centennial College. Service will operate in the midday and peak periods, from Monday to Friday. Peak period service will be scheduled every 10 minutes and midday service will be scheduled every 15 minutes. The new express bus service will stop at major stops where customer demand is highest. How important is this announcement? An ususually large number of the public were on hand for the press conference held 9:30 Saturday morning in the parking lot of the Silver Mile By the Bluffs plaza.